Transport in China has experienced major growth and expansion since 1949 and a comprehensive transportation system was created, combining airplanes, railways and highways. Even Tibet, one of the most inaccessible regions in the world can be reached by train since the operation of Qinghai-Tibet Railway project; and the first run of the Beijing - Shanghai high speed train which set to open in June 30, 2011, it is another aggressive effort by Chinese movement. Travelling around China by flight is the most convenient and fastest means of transportation, but also the most expensive. Flying through quite a large distance in less time, means you have more time and energy to enjoy your trip after your arrival at each destination. China airlines have witnessed dramatic improvements since 1979, and there are over 1,000 domestic and international airlines were operated throughout the country. Beijing, Shanghai, Hong Kong, Guangzhou, Kunming and other provincial capitals became regional aviation hubs, which not only have domestic flights to other parts of China, but international flights to major cities of the world. The largest nine airlines in China are Air China, China Eastern Airlines, China Southern Airlines, Hainan Airlines, Shanghai Airlines, Shandong Airlines, Xiamen Airlines, Shenzhen Airlines, and Sichuan Airlines. The total number of planes of all mainland Chinese carriers combined will be near 1,580 by 2010, up from 863 in 2006. By 2025, the figure is estimated to be 4,000, mostly Boeing from the United States and Airbus from Europe. In 2007, China has 467 airports. The three busiest ones include Beijing Capital International Airport, Shanghai Pudong International Airport, Shanghai Hongqiao International Airport and Guangzhou New Baiyun International Airport and Hong Kong Chek Lap Kok International Airport. Rail travel is a popular and inexpensive way for most Chinese people to getting around the country. The railway network of China, centered with Beijing, boasts domestic and international operations. Travelers can take trains from China to Moscow (Russia), Ulan Bator (Mongolia), Hanoi (Vietnam) and Pyongyang (North Korea). China is the first and only country to have commercial train service on conventional rail lines that can reach 350 km/h. If you travel by High Speed Rail, you can choose some operational lines like these: Beijing-Shanghai Intercity Railway; The Wuhan-Guangzhou High-Speed Railway; Zhengzhou-Xi'an High-Speed Railway; The Shanghai Maglev Train; The Beijing-Tianjin Intercity Railway; Haikou - Sanya Intercity Railway. Note: There are no English-speaking staff and limited English signs on the train and railway station. Generally speaking, there are 4 classes of train tickets for regular trains in China, respectively, ‘Hard seat', 'hard sleeper', 'soft seat' and 'soft sleeper'. Easy Tour China would recommend ‘soft sleeper’ to the international tourists, which is much more comfortable for long-distance travel. Besides, passengers who take soft sleeper enjoy a separate waiting lounge as well as preferential boarding. The EMU (electric multiple unit) trains are always quite new and very comfortable, offering the first and second class seats. China governments have built thousands of miles of highways around the country, and almost every town, counties and cities are accessible by highway. Travelling by bus around a city or province is much easier than several years ago. Please note that the road condition in remote area can be very poor; while the bus tickets are easier to get than that of train. 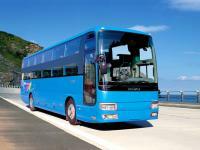 Some long distance bus might stop at least one more stations after arrival in one city. Please ask someone (a Chinese) to write down the correct name of the bus station you are supposed to get off before hand, otherwise, you might get confused and have no idea where to stop. Easy Tour China requests the local guide to inform the other guide at the destination to go to the right station to pick up the clients after the clients get on the bus. Usually it is quite crowded at some bus station, please keep cautious on the pick-pockets and beggars. There are many inland waterways in China, which played a great role in ancient transportation, and some of them are still in use today. Subway is not fully developed around China and only available in big cities like, Beijing, Guangzhou, Tianjin, Shanghai, Nanjing, Shenzhen and Hong Kong. It is a good choice to getting around these cities by using metro way, which can save travelers time and money. There are many English signs inside the subway station as well as a scam machine. With the once nickname - the kingdom of bicycles, there are many many people biking in the cities, counties and villages before. 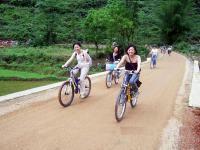 With the development of public transportations, biking is not as popular as before but still available on the streets. Some people regard biking as physical sports and riding around through cities or even provinces! 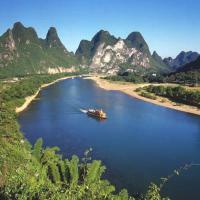 Guilin, Yunnan, Sichuan, Tibet are the top destinations for a biking tour in China. Taxi is fast and convenient to take you to the destinations like hotels, airports, railway station and scenic spots, and the cost is really reasonable indeed compared with that in Europe and North America. If you halt a taxi at the airport or train station, be care of the illegal black taxi (unlicensed), remember to go directly to the official taxi line or station to catch one and insist on using the meter. Never go with those who try to approach you asking “where are you going” or saying “taxi”. Tipping is not needed for your taxi fare in China, but in some cities the local governments allow the taxi drivers to charge extra 1-2 Yuan for the extra fuel tax over the amount shown on the meter. Walking around offers the best and authentic experience of a destination; just with a tourist map of the city, you can walk along the markets, streets, neighborhoods, seeing something you would miss from the tourist coach. Look around the both sides when crossing the street and be care about your belongings since pick-pocketing is ubiquitous on crowded streets and tourist sites. Please also note that some young Chinese people approach tourists and claim to be art students. They try to convince you to visit their art exhibition selling various kinds of “arts” allegedly produced by themselves at much higher prices. You are not recommended to follow the strangers to go and visit the local bars, massage centers or tea houses. Foreigners could be ripped off after your consumption.